A tool that will greatly improve the joy of preparing food is a quality chef’s knife. It’s something that you don’t know you’re missing until you purchase one. Owning a chef’s knife will require proper maintenance, so you should hone or sharpen your knife every few uses. Of course it’s easy to delve and get lost into the cooking knife world. You can spend a fortune on kitchen tools that often make no real difference with a more affordable set. That’s why we’ve selected the best chef’s knife starter kit so you can focus on becoming a great chef. 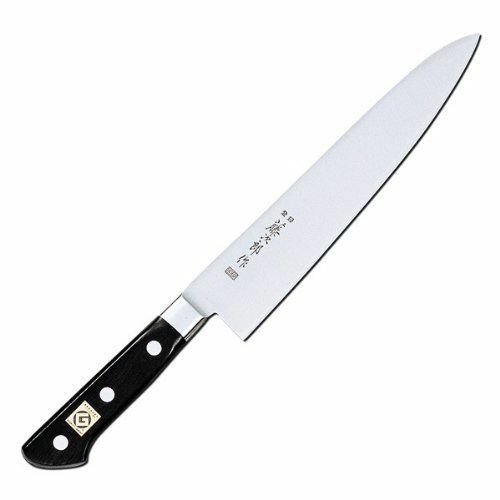 The Tojiro DP Chef’s Knife is Japanese made steel with a double bevel. It sports a solid Western style handle, making it a suitable beginners knife. Be warned though, this knife is stupid sharp. You glide through meat, fish and vegetables without a second thought, so be careful when it’s your first time handling this chef’s knife. Here’s a little video to brush up on your basic knife skills. The Tojiro knife is the best allround utiliterian knife you can get in this price range (around 70 bucks), so this is first item that should go in any serious kitchen where things are getting cut on a regular basis. 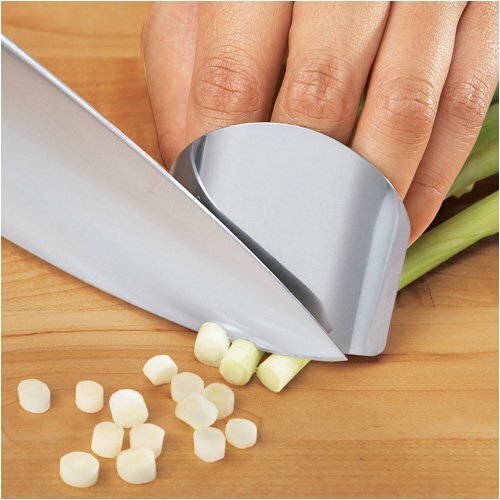 We can imagine that even with the right cutting technique you’re still worrying about accidentally cutting your fingers. This finger guard will have you slicing and dicing with confidence in no time. It’s only ten bucks, fits all finger sizes and can go in your dishwasher, so there’s no hassle in using one. ADJUSTABLE FINGER LOOP - Will fit any finger size and is suitable for both your left hand or right-handed use. Eventually, your Tojiro will not cut as effortlessly as when you first got it. Lucky for you, it’s an easy knife to sharpen with a whet stone. 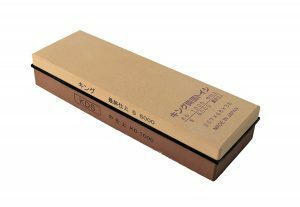 This King 1000/6000 combination whet stone is Tojiro’s friend and a good starter choice for keeping your chef’s knife razor sharp. Some people consider knife sharpening an art and just like collecting high grade knives it can become an expensive hobby. The King will probably be all you need for sharpening knives. To get the best results using a whetstone it’s good to use some additional help. A professional chef’s knife wielder and sharpener will probably disagree with me, but I’d recommend buying a set of sharpening angle guides. These plastic guides attach to your whet stone to make sure you’re sharpening your chef’s knife at the recommended angle. See the video below. 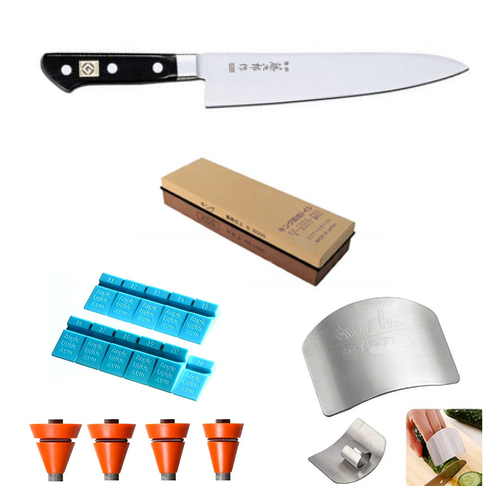 You’re now set to prepare a mean meal with your chef’s knife and accessories. Stay tuned for our next cooking related starter kit post.